This Christmas, join us in spreading some love to the unfortunate kitties -- those who don't have a home but the streets. 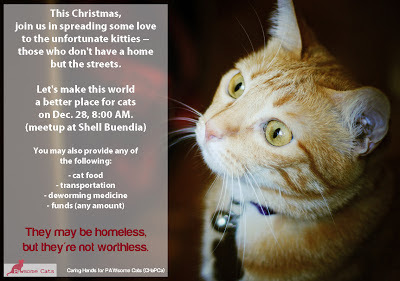 Let's make this world a better place for cats on Dec. 28, Friday, 8:00 AM (meetup at Shell Buendia). "They may be homeless, but they're not worthless." Please share. Thanks to fellow PAWsome Cats lovers Tinette and Janice for helping us conceptualize this effort. You may send us a message through the PAWsome Cats FB page or via email: meow [@] pawsomecats [dot] com if you have questions/clarifications. we want to join! where do we get deworming medicine?